The U.S. Food and Drug Administration (FDA) and the Association of Food and Drug Officials (AFDO) are proud to partner for the Calendar Year (CY) 2019 AFDO-Managed Retail Program Standards Grant Program. The program provides funds for the completion of projects and training to enhance conformance with the Voluntary National Retail Food Regulatory Program Standards (Retail Program Standards). Each year, grant funding is open to state, local, territorial, and tribal regulatory retail food programs that have enrolled in the Retail Program Standards. Applicants to this program can expect a simple application process, up-front funding when required by the project, and simple reporting requirements. The CY 2019 Retail Program Standards Grant Program closed to new applications on October 24, 2018. We are very pleased with the number and quality of applications from across the country. Of the 530 applications received, 464 were funded—resulting in an overall award rate of 87.5%! In total, $1,744,085 was awarded across four project categories – Small Projects, Moderate Projects, Training, and Food Protection Task Force Support Projects. See funding statistics and award information here. Food Protection Task Force Support Projects up to $3,000, to assist jurisdictions in meeting the requirements of Standard 5 Foodborne Illness and Food Defense Preparedness and Response and/or Standard 7 Industry and Community Relations. Please bookmark this page, http://afdo.org/retailstandards, as it will always contain the most up-to-date information about the grant program. If you would like to receive news and updates when new information is available, please register your email address here. 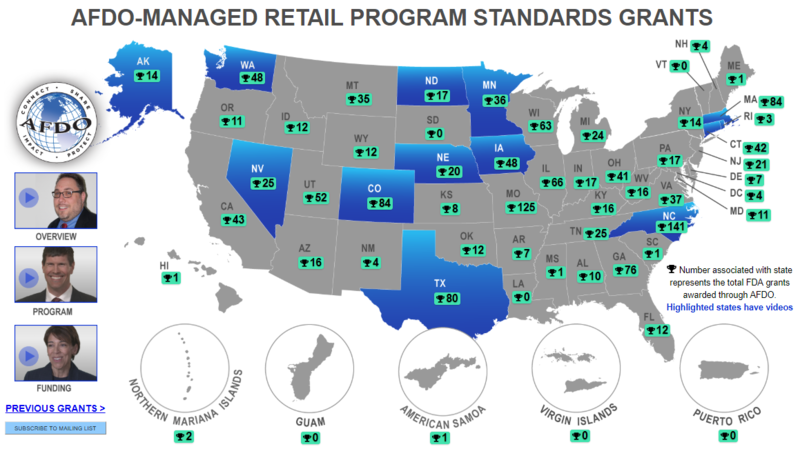 Since the inception of the AFDO-administered Retail Program Standards Grant Program in 2014, more than $8.1 million has been awarded across 1,985 grants. Our grantees have responded with overwhelming high praise of the program, writing everything from “This has been the best experience in getting much equipment and supplies we need to continue our food training;” to “simplest grant application to date.” You may view grantee-submitted videos about their projects and opinions of the program by clicking the map below. To view the status of your current grant award(s), view and print copies of both awarded and declined applications, view and print copies of your official award letter(s), or submit required reports and reimbursement requests, please use the username and password provided during the previous grant application phase to access the grant portal. If you cannot find your username and/or password, please visit https://retailstandards.fluxx.io/forgot_password to reset it. If you have any questions, please contact us at (850) 583-4593 or retailstandards@afdo.org.